To talk of many things. No plans yet to write about cabbages. But it is certainly time to talk about bespoke shoes. I set an appointment last week to go see George Glasgow at GJ Cleverley to be measured for my first pair. Rather as I did previously with suiting, expect a series of posts here on every stage of the process. There’s something rather charming about being measured for shoes. At Cleverley the first stage is to stand on two facing pages of a book, so that your feet can be traced onto the paper. It feels rather odd standing on a book to begin with, but doing so in your socks in The Royal Arcade, while a man such as Mr Glasgow runs a pencil around your toes, is even more peculiar. Still, here stood stars of stage and screen alike – not to mention royalty. When the shoemaker is tracing your foot the key is to keep the pencil upright. The smallest change in angle will mean a millimetre difference on the last, which can be the difference between comfort and pain. He will also sweep around your instep, with the pencil at 45 degrees, in order to indicate the height of your arches. Looking back through the Cleverley measuring book, there is a substantial difference here between men. Some, like myself, have almost an inch in difference between the outline and the inside of the arch. (“Healthy and strong,” Mr Glasgow called it. He’s such a tease.) Others have merely a few millimetres. They will require greater support inside the shoe, and the waist will not be able to cut in quite as far underneath. The length of your foot is also measured. At Cleverley this is done with a wooden rule dating back to 1928. It still looks in pretty good shape – no doubt due to the substantial brass fittings at the joint. While this length is a good guide for the shape of your last, it will always be made 1½ sizes longer than the measurement, to allow for your big toe rolling forward as you put your weight on the ball of your foot. Next the circumference of various points is measured. First your joints – between the base of your big and little toe. Then just behind the joints, to give an indication of how quickly the foot narrows. Next around your instep – roughly where the top of the laces would be. And finally from that same point on the top of the foot to the back of your heel. The thing that struck me as these measurements were being taken was their consistentcy. At each point my right foot was 10-and-something inches, while my left was usually 9-and-something. Height just replaces width as you move towards the back of the foot. It also put into numbers what I already knew, that my right foot is almost a half size smaller than my left, but significantly wider. While the first is very common, the latter together with a narrow heel makes me a good candidate for bespoke. Finally, Mr Glasgow ran his hands over my ashamedly hot (not to say sweaty) feet. He was looking for any bumps or peculiarities, such as hammer toes, swollen joints (most common on the big and little toes) and spur bones around the heel. Many of these are caused by men wearing ill-fitting shoes for much of their lives – or shoes that have not properly been worn in or maintained. Mr Glasgow found no such oddities, most likely because I am too young for my feet to have distorted much. 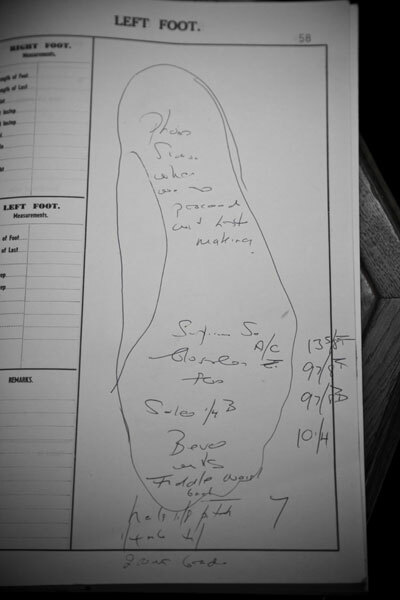 As a final point, some shoemakers insist on measuring a man’s feet at a particular point in the day. Your feet grow in size notably as you walk on them and keep them encased. Cleverley does not consider this significant, not even noting the time the measurements were taken. For Mr Glasgow the natural give of the leather is sufficient to cope with the daily fluctuation. You can follow the discussion on Bespoke shoes at Cleverley: Part 1 by entering your email address in the box below. You will then receive an email every time a new comment is added. These will also contain a link to a page where you can stop the alerts, and remove all of your related data from the site. Very much looking forward to this series! Good point Heath! I have to say for all the years I have known that quote, this is the first time I have written it down. Ralph, the price is £2100. The reason I chose Cleverly was that I knew George very well already and I have worn bespoke shoes (though not my own, see previous post) from them before and been impressed. This is great. I’ve never seen a walk through like this. This “behind the scene” of how custom shoes are made is really interesting. From now on, i won’t take the process of making shoes by hand for granted. Nice article. The whole series is fantastic. I really like your series on different shoe and clothing projects but I find it hard to follow the series. It would be very helpful if there were a link to next part in the series at the bottom. The related post sometimes include the next part but most of time they only seem to include a few random posts in the series. I understand that you don’t have the next part when you publish the post but if they were updated afterwards it would be very helpful. Thanks! Probably not the best place to post but I want to let you know that I went to the cleverly trunk show in Beverly Hills this weekend and I was thoroughly impressed – both George Junior and Senior are amazingly professional and friendly and helpful. They had a great range of shoes and I’m looking forward to my first three pairs. Thank you! !